Having an inbound marketing strategy is the core to your online marketing efforts. Inbound marketing is the art of attracting our customers to us by providing valuable information, rather than pushing our products and services on them. Creating and sharing useful content helps the buyer move through the purchase process and makes your business more credible, trustworthy, and visible in the process. In addition, giving value with no strings attached builds trust and people buy from those they know, like and trust. The challenge for most small businesses is to create a strong web presence as the foundation of their inbound marketing efforts so that search, social and content marketing strategies are effective. Your digital footprint is no longer just a website but now includes your social media profiles, directory listings and other web properties that present your business to your target market. 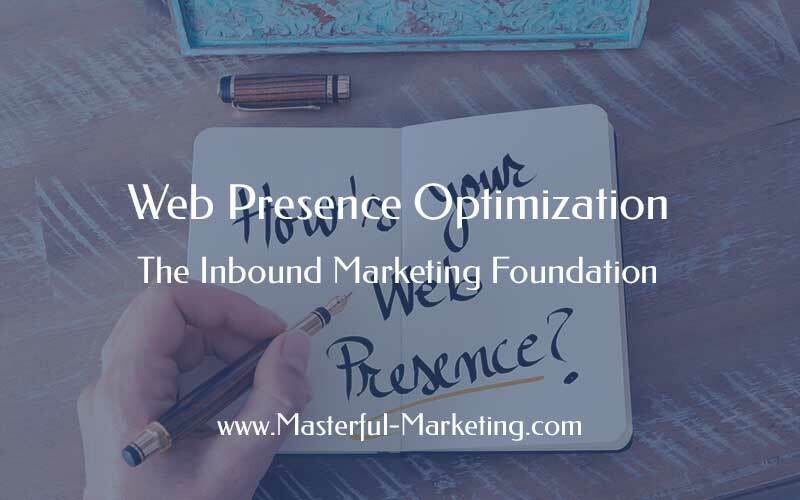 Web presence optimization extends search engine optimization to all of your web properties to create better visibility, awareness, and recognition for your brand. By optimizing content across your entire web presence, including your website, social media, other blogs and press releases, you present a more unified, consistent image for your brand no matter where someone finds your business online. The best way to start is to do a simple search for your business name and your name to assess your visibility. Just because you may not have created social media profiles or directory entries for your business doesn’t mean that you don’t have a presence. Is your brand consistent across all web properties? Where does your web presence need strengthening? Would you hire your company based on what you found? A regular audit of your web presence is important to maintaining a healthy online presence. Since 94% of B2B buyers and 60% of consumers start their buying process with a search, understanding how people search for your products and services plays an important role in creating a powerful web presence. What words are they using to search for the solution? Do people use different terms on social networks than in search engines? Once you intimately understand how your customers are searching, you can incorporate the words and phrases people use into your content which will result in aligning your content with your customers needs. Your website is the hub of your online presence and central to all your marketing efforts. It’s the one property you totally control, therefore it needs to create an amazing first impression. Your website is where you send people from your social media outpost to learn more about you and provide them with valuable content. Is your website built on WordPress to make it easy to add content? Is your content easy to find and share on social networks? Is your website optimized so your audience can find you when they are searching for a solution to their problem? WordPress is the best content management system for small businesses because of the power and flexibility it provides, while keeping content production simple. Content marketing focuses on creating and distributing valuable content to attract and retain your target audience. Rather than selling your products and services, you educate your audience through inspiring and relevant storytelling. What content does your audience want or need? How does your audience want that content delivered (video, podcast, blog, ebook, infographic)? How often will you deliver content? What resources will you use to develop the content? How will you distribute this content so it will be found? Content marketing is important to all businesses if you want to be found. Great content properly optimized will help you gain the visibility you need to stay ahead of your competition. Increasing your online visibility takes work. But since the cost of acquiring a qualified lead through inbound marketing is more than 60% less than through outbound tactics, small businesses can’t ignore building a strong web presence. Knowing what your customers need, delivering that content in the format they want it and helping them solve a problem makes your business their first choice when seeking products and services.